This is my first year speaking at SXSW, and I decided to join a small group of veteran and new SXSW speakers in San Francisco to trade tips. I came away humbled by the sheer variety of talk topics and smart people in the room. My sketchnotes follow. 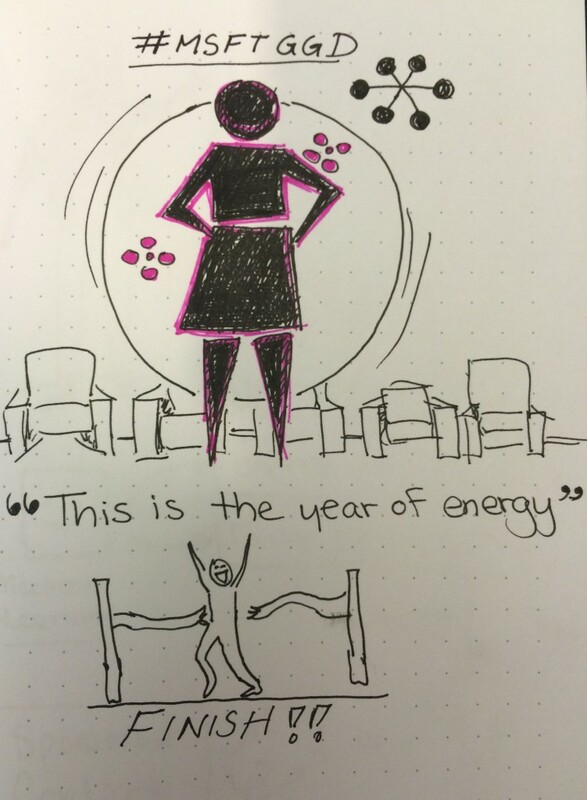 At UX Australia, customer strategist Marie-Claire Grady kicked off her 10-minute talk “The One-Way Door to CX-Committed Executives” with a story about her grandmother. Her grandmother was a shopowner, and she made a commitment to walk through the front door every day so she could see of her shop what her customers would see of her shop. As Marie-Claire continues her presentation, this concept of needing executives to experience things exactly how their customers experience things becomes the key to improving any product’s or service’s experience. 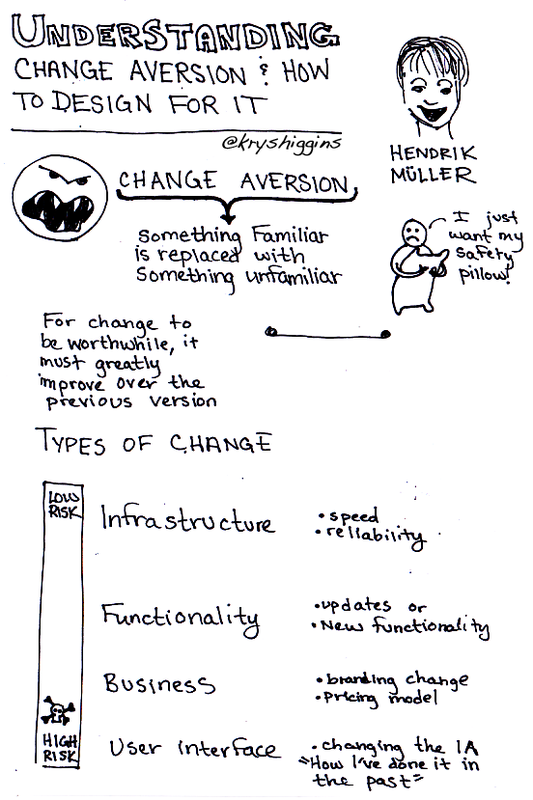 In Understanding change aversion and how to design for it,” Google Sr. UX Researcher Hendrik Müller discussed the reasons why users are unhappy with many product or UI changes. By sharing a case study from Google Drive, this presentation proposed methods to help users acclimate to a changing experience. 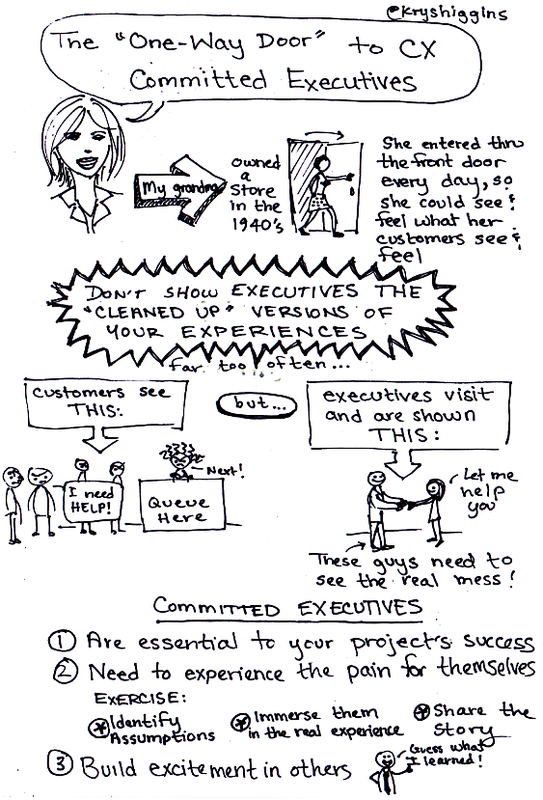 My sketchnotes follow. 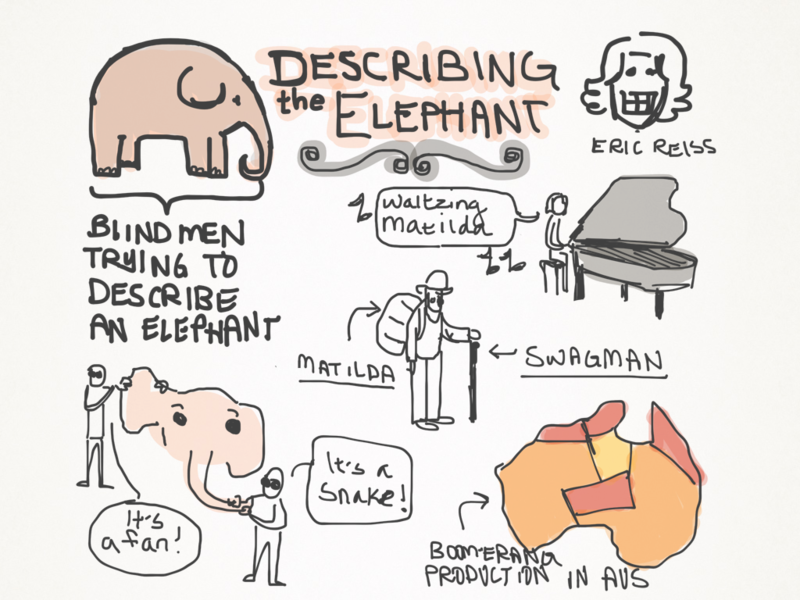 Eric Reiss gave a rousing second day presentation at UX Australia 2014, complete with a performance of Australia’s “Waltzing Matilda.” In his talk “Describing the Elephant,” Reiss encouraged us to recognize that UX cannot be managed by a single person, and needs to be considered a collaborative, shared discipline. My sketchnotes follow. 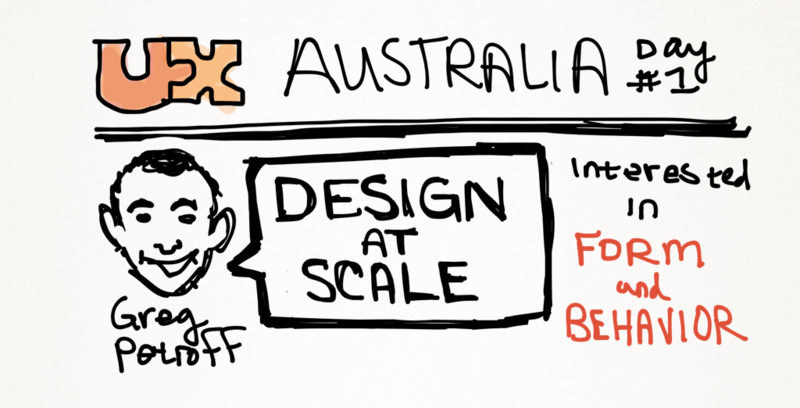 GE design leader Greg Petroff kicked off UX Australia 2014 with an inspiring keynote. While he touched on the impact of his work with GE’s design system, he also spoke passionately about how the survival of design depends on its democratization. 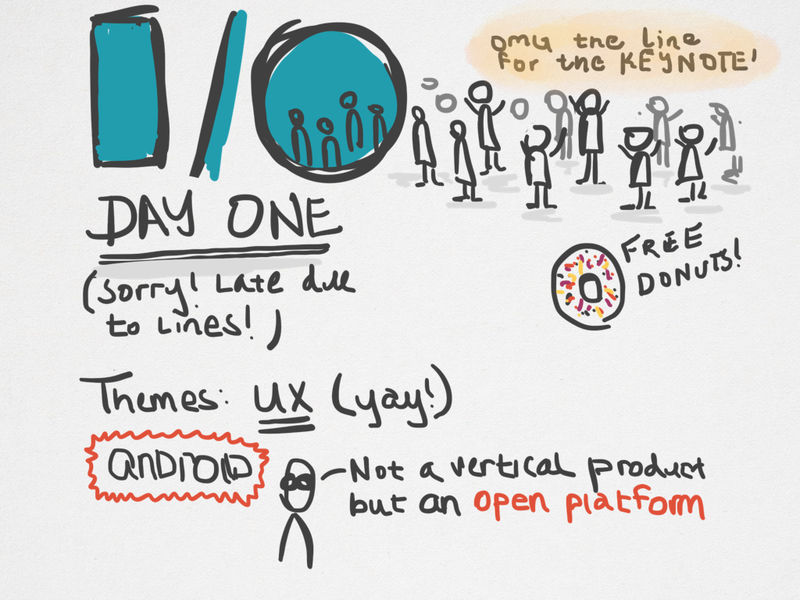 My sketchnotes from the keynote follow. This UX Australia 2014 talk by Sarah Lloyd delved into aspects of neuroscience and situations that affect creativity. 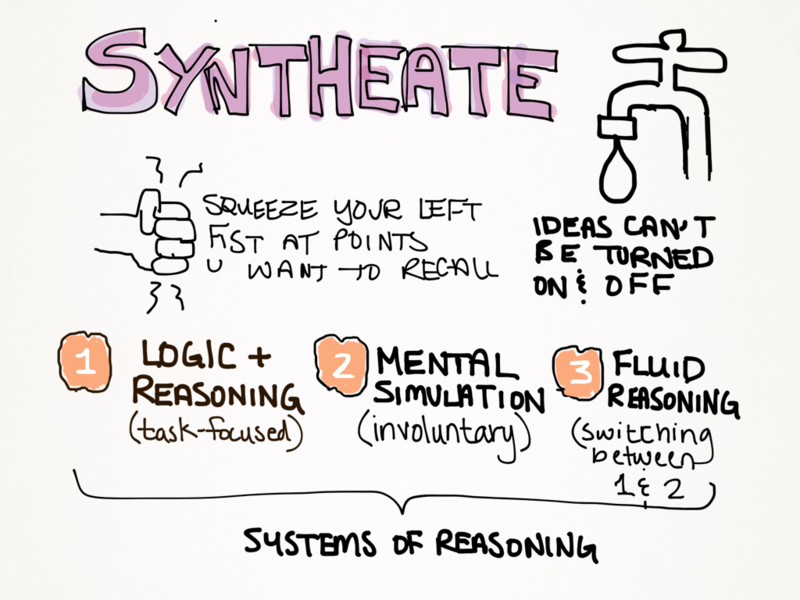 Syntheate Ideation: Tools for Infinite Creativity breaks down the creative process into 5 steps with insights for each, such as how to help us create new connections and pathways in the brain (a key element of idea synthesis). My sketchnotes follow. 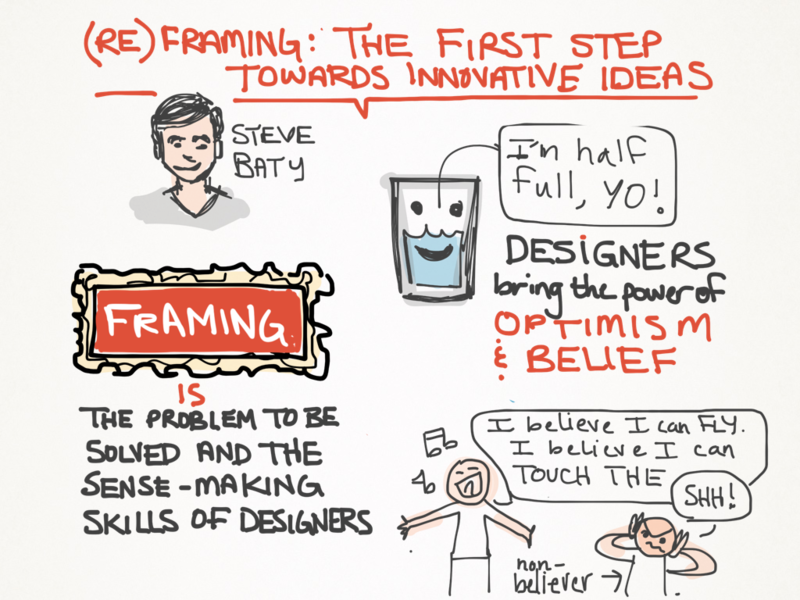 The following sketchnotes were taken during Steve Baty‘s talk (Re)framing: The first step towards innovative ideas. This talk was given at UX Australia 2014 and discussed how the techniques used to frame problems can mean the difference between incremental improvements and bold new approaches. Elliot Kotek of Not Impossible Labs gave a moving talk at this year’s V2V conference. In “3D Printing for Humanity’s Sake-Project Daniel 2.0″ he recounted the stories of an ALS patient who yearned to get back to graffiti art, and of Daniel, a double-amputee in the Sudan who didn’t want to be a burden on his family. In the case of Daniel, 3D printing not only brought him new prosthetic arms, but was a skill taught to his entire community so they could use it to take care of future needs. My sketchnotes follow. Star Trek fans familiar with the concept of replicators would have enjoyed “3D BioPrinting: Changing The Future of Medicine!“, a talk given by Tevido Biodevices CEO & Co-Founder Laura Bosworth at SxSW’s V2V conference. Laura discussed the future role of 3D BioPrinting in creating live tissue, and how it could start by focusing on breast reconstruction for cancer patients. My sketchnotes follow. 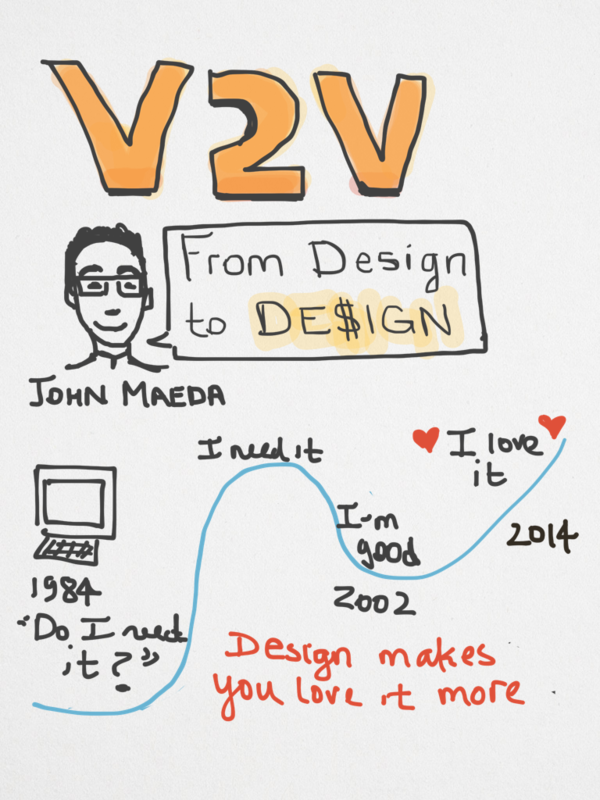 On the second day of SxSW’s startup-focused V2V conference in Las Vegas, audience members had the pleasure of hearing John Maeda (KPCB design partner, eBay Inc. design chair, RISD president & MIT professor) give the opening keynote. With background into design vs. art, he discussed design’s increased importance in the workplace now that it’s no longer enough for products just to be needed, but that they need to be loved. My sketchnotes follow. This session, held during the first day of Google I/O, focused purely on design principles and process for Android Wear and Google Glass. A panel of 4 designers rotated through an in-depth presentation sharing their insights on topics ranging from voice input, contextual design and glanceable displays. This presentation also stood out as one with a strong resonant theme: The world is the experience. Before the I/O announcement of Android L and “Material Design”, this session was originally called “Cross Platform Design”. The speakers discussed some of the overall principles and applications of the company’s new design system across devices. I enjoyed the discussion of metaphors as it sounded similar to the original push for skeumorphism in early mobile app design. 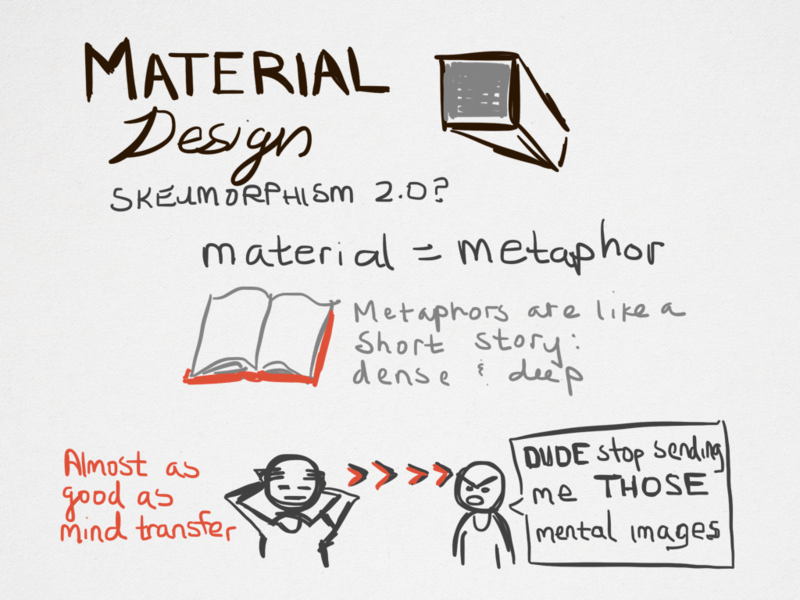 We’ve focused far too much on judging skeumorphism as 100% bad, when instead we should focus on what it was trying to achieve (metaphors are effective at communication) and work on improving that foundational concept (as Material Design is attempting to do). Learn more about Material Design here. This year’s Google I/O keynote was jam-packed with announcements ranging from Android Wear to Google Drive for Business. One of the big themes was the need to create seamless, cross-platform experiences. The following are my sketches from the Google I/O opening keynote with a focus on the cross-platform announcements like Wear, Auto and TV. Girl Geek Dinner #61 was hosted at Microsoft’s new technology center in Mountain View. In addition to mingling with fellow female designers, developers, businesspeople and more, the evening included two talks and a panel with some talented Microsoft employees. 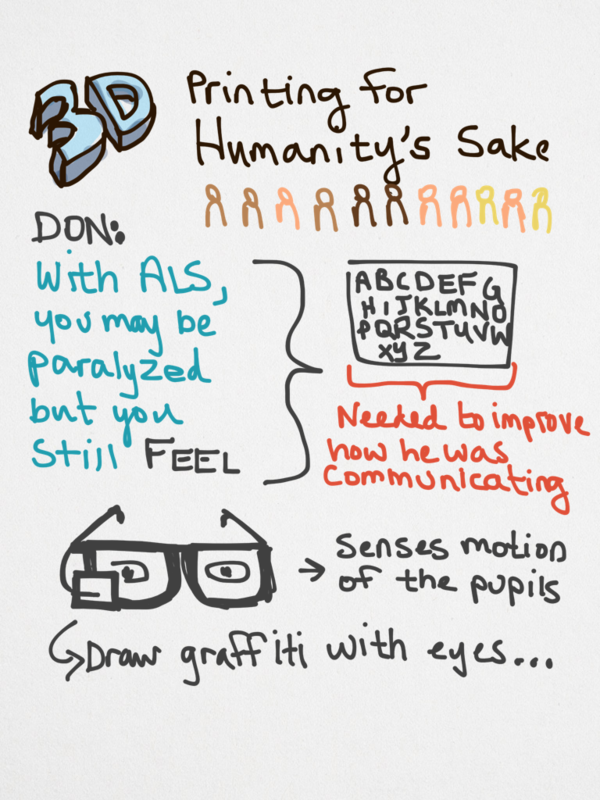 Below are my sketchnotes from the two main talks. After checking out the design principles of Android Wear, I found myself thinking particularly about the third principle, “Helpful”. 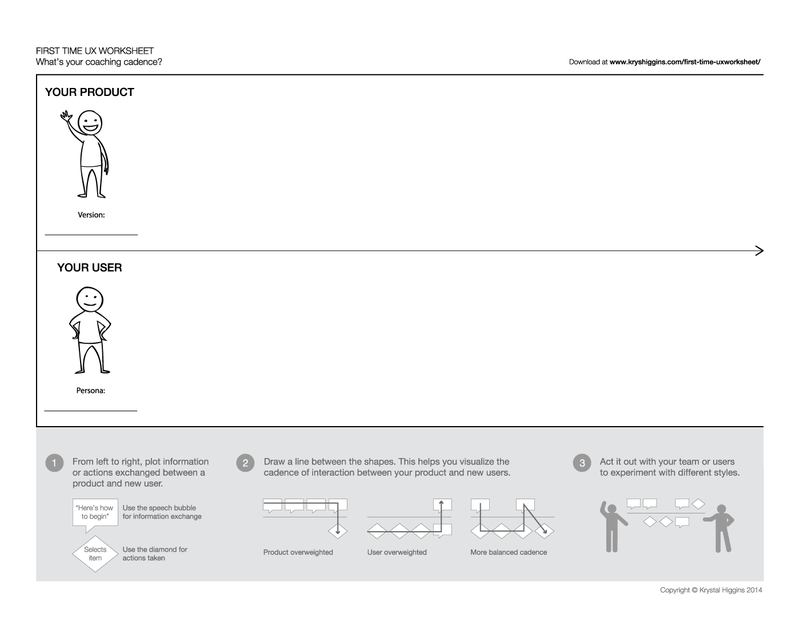 Certainly in UX design a product needs to be helpful before anything else. 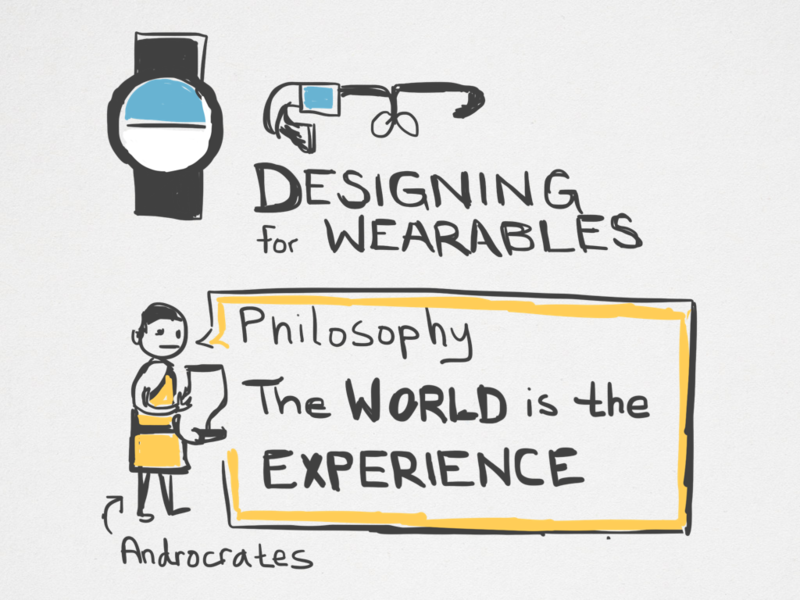 But what does it mean to build helpful experiences for wearables, specifically?